The Victorinox type can opener is a very handy and useful function because it got the flat screwdriver tip that also can be used as a flat phillips function. There is a small angle so it does fit into a phillips head and it will work well for such tasks. Because it is a flat design and because of the thickness there are some limits for what it can take. One must also take into consideration the slip joint mechanism and that there is no locking function. For all types of smaller tasks it can be used safely. I would believe most people that have been into Swiss Army Knives know that it can take some hard tasks but there is a danger of bending the tip if abused. This type of can opener is mentioned in the 1951 milestone in the evolution of the 91mm Officiers category. I would expect this to be in a general term. There are some variants from 1951 and up on it as well. It was a very successful change on the Victorinox evolution and I would believe it is part of the constant product development, to increase the versatile product. Victorinox use this today and it was also implemented on the New Delémont collection and products. If there are one milestone that could be interesting to mention is the change Victorinox did in 1951 with the aluminum dividers or liners. The impression of a more modern knife is here at this time. Before this milestone there is an extra important milestone: in 1950 Carl Elsener the third and Eduard Elsener takes over the control of the company. Then my most important milestone is the patent application from 8th July 1949 that show the can opener with flat tip part. 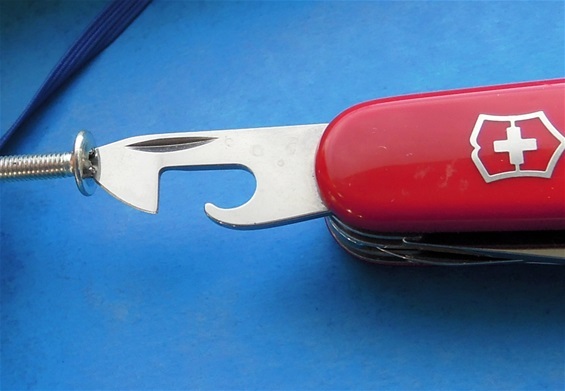 We know from history how the Swiss Army Knife received the fame after WW2. The period 1949-1970 is important. After 1971 the use of the +Pat stamp on the can opener is gone usually. 1951 Flat screwdriver with cap opener change side.